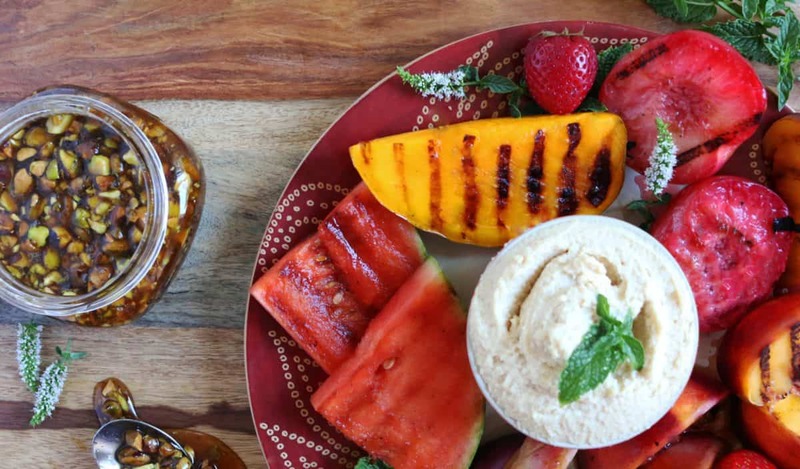 A bit of healthy and a bit of indulgence, yes please! 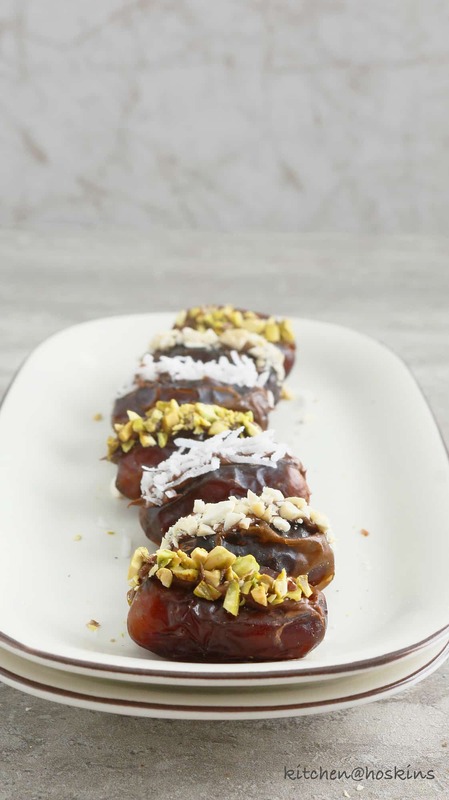 These Nutella stuffed dates are sweet, chewy, chocolatey with a bit of crunch. New year has got to begin with something sweet. SWEET yet not ruin your resolutions. Aaand, something that the kids would love as well. 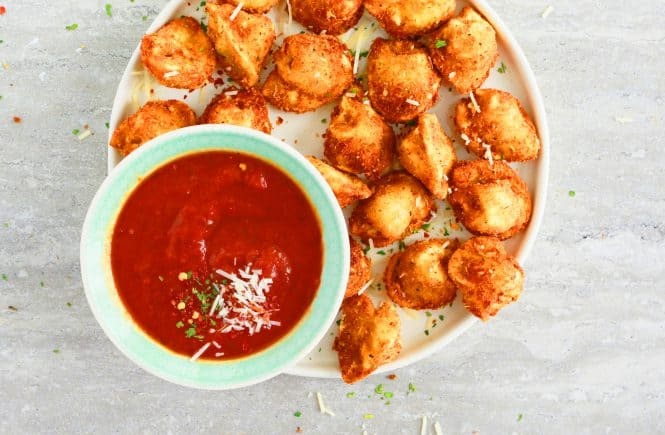 Bite size dessert, school lunch box, midnight munchie or just snack anytime. These Nutella stuffed dates are sweet, chewy and a bit of crunch. The best part is the Nutella. DUH. 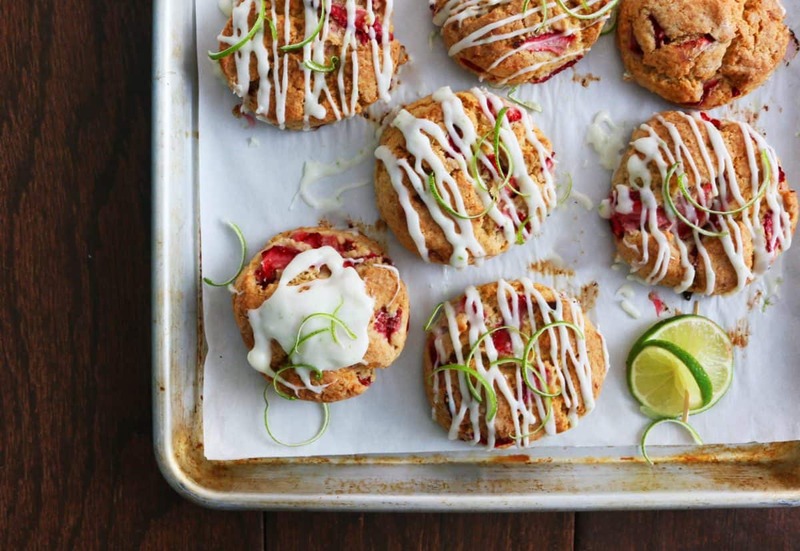 But, best two ingredient recipe! Anything that is stuffed with Nutella is got to be good, right? You will also love…. love these 4 Ingredient, Gluten free, Fudgy Nutella Brownies <— SOOO GOOD. 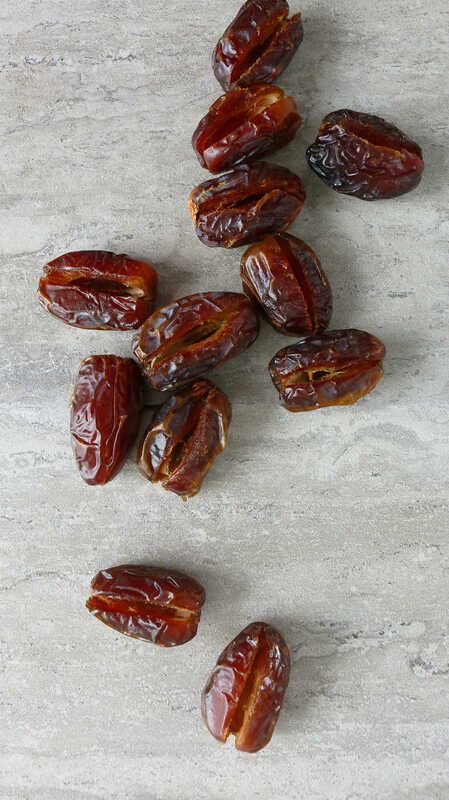 It begins with soft, plump Medjool dates. I prefer these and not Noor variety (to learn more about the two types over here – click here), since these are easier to work with in this recipe. 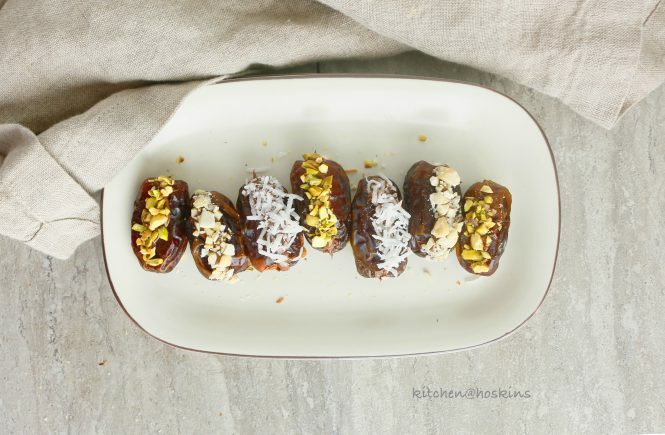 How to make this easy stuffed dates ? Slit open one side of the date and remove pit. Stuff the cavity with Nutella ( you could just use a small spoon but, I like to squeeze Nutella from a zip lock bag, since it makes a cleaner looking Nutella stuffed dates). You could leave as is, but a little embellishment goes a long way. 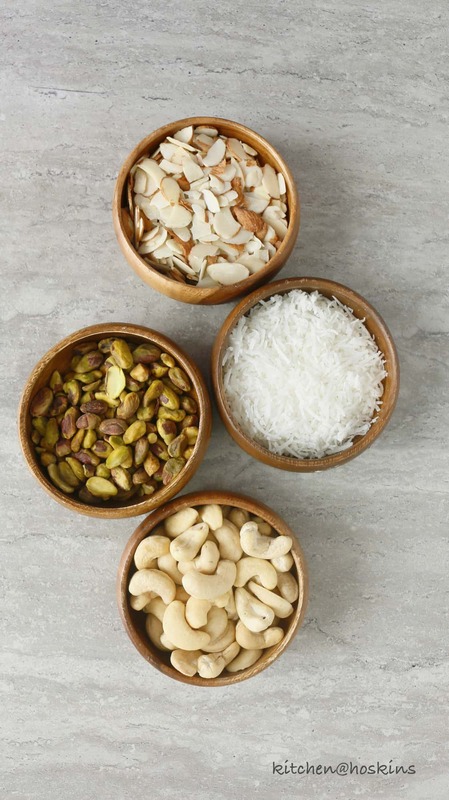 Top the Nutella part with chopped cashews, almonds, pistachios, shredded coconut or a combination of nuts (chopped hazelnuts will be great too). Now, comes the tough part of the recipe. WAIT…. let it sit in the refrigerator for several hours to get more awesome. 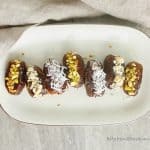 The dates get firmer, chewier and some of the Nutella gets absorbed into the dates, making it a perfect bite size treat. Slit dates on one side, remove pits. Spoon Nutella into a small zip lock bag, seal bag and snip off a corner. Squeeze into the cavity of each dates.Use as much or as little as you'd like. 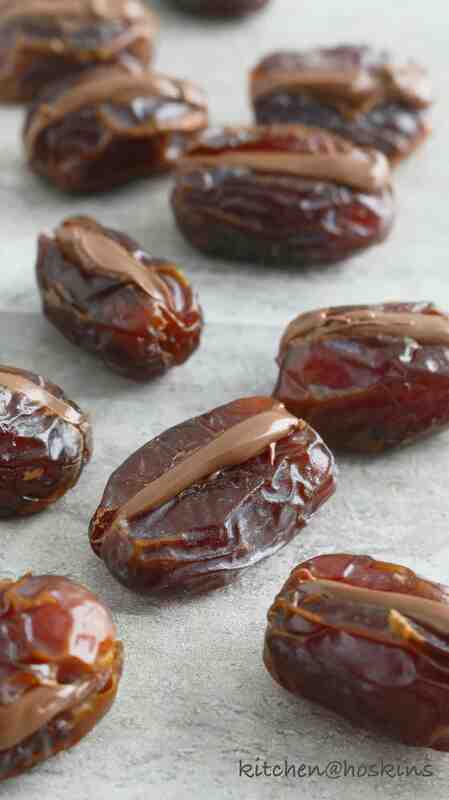 I used about 1 teaspoon for each date. Sprinkle your choice of chopped nuts on top of the Nutella. 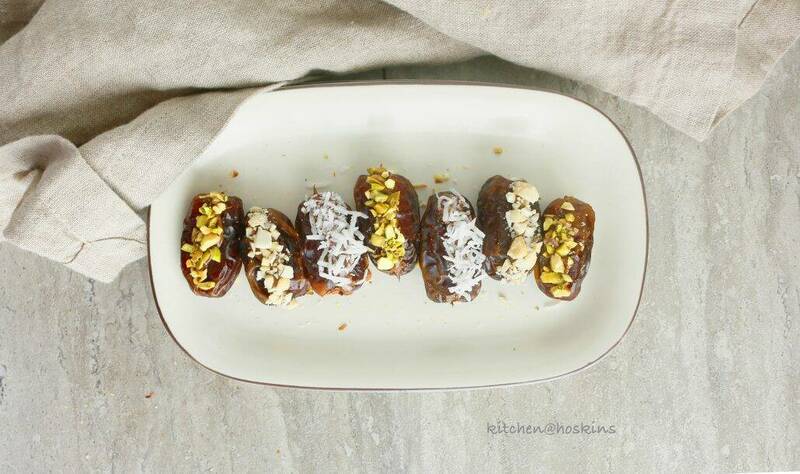 I used different kind (chopped almonds / cashews / pistachios / shredded coconut) on each date to give variations. You can choose to use whatever you have on hand. I know you are tempted to pop these bite size treats into your mouth, but I highly recommend refrigerating these for a few hours to firm up and and for the Nutella to soak into the dates. Sounds like a quick and easy yummy treat….plus Nutella is AMAZING!! Yum!